Confession time - we love math! Now, you probably don't if you are reading this because that would mean you are looking for a tutor. But that's OK - we get that math can be a struggle sometimes, and understand how frustrating it can be to stay on top of everything that you need to do at school. Sometimes, you just need a little extra support. Class sizes in the city can get pretty big, and it's easy to feel like you have gotten lost in the shuffle. Well, that's where we come in. 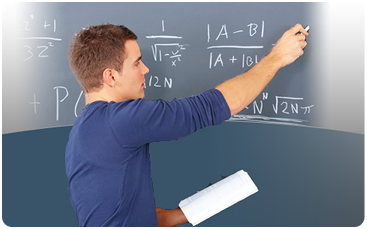 Our math tutor is a top notch teacher within the public board of Calgary with over 10 years of experience and resources. Our goal with all math students is twofold. First, for them to believe in themselves - to believe in the ability and potential that we know they have. Second, to make the concept of learning mathematics just a little less stressful, and perhaps even a bit fun! Our sessions relaxed and low key where an environment conducive to learning can be established. So, what would math tutoring at cpm-e look like? The two main things we are going to do in our time together is go over the stuff you did not understand since we last saw each other, and then start going through the stuff you are about to learn in the upcoming days. This later time is very important - we believe pre-teaching is going to set you up for a much higher rate of success when it comes to understanding the concepts in class. We are also going to talk about stress management, organization, time management, and all that fun little stuff that can make the difference between seeing your potential reached and just seeing your potential off in the distance. At the end of the day, you're the boss. This is your learning, and we want you to take ownership of it. We want you to come each week with your own agenda in mind - questions you need to go over, concepts you need to discuss. When a student is willing to work at this and own it, success is much closer than just the horizon. Above all, don't let math stress you out. It has got to be one of the most powerful subjects you will ever deal with in school, because it is the one subject you will never be able to stray from for the rest of your life. Whether or not you want to admit it, you use math every day. So, why not enjoy it? Have questions? We want to hear from you. Check out the links above for more information, and feel free to contact us at info@cpm-e.com.